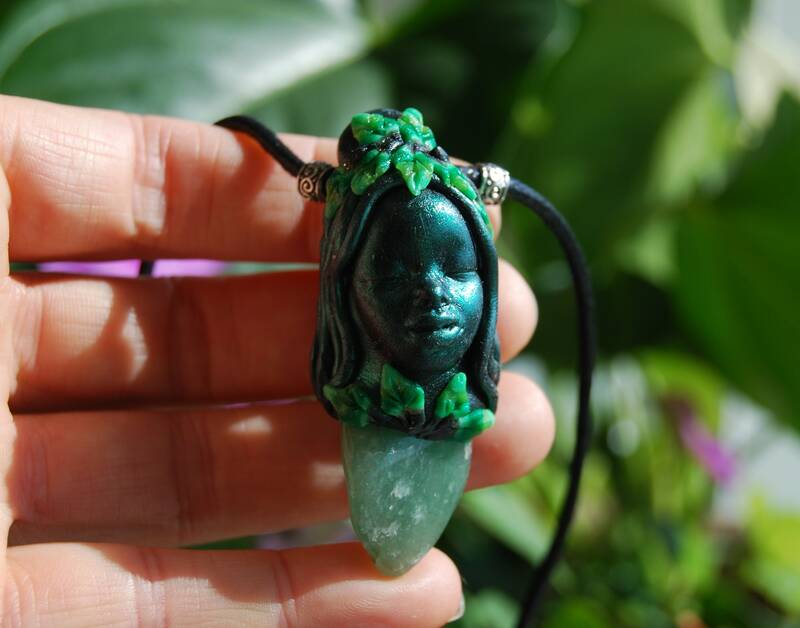 This is a Aventurine stone in a durable goddess clay setting that I made myself. 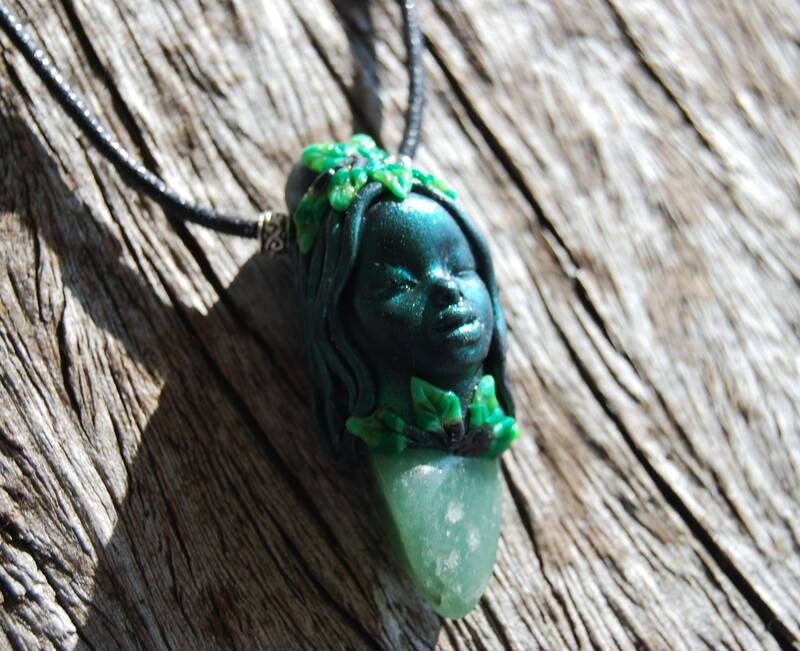 Aventurine is a variety of Quartz characterized by bright inclusions of Mica or other minerals that give a shimmering or glistening effect to the stone. 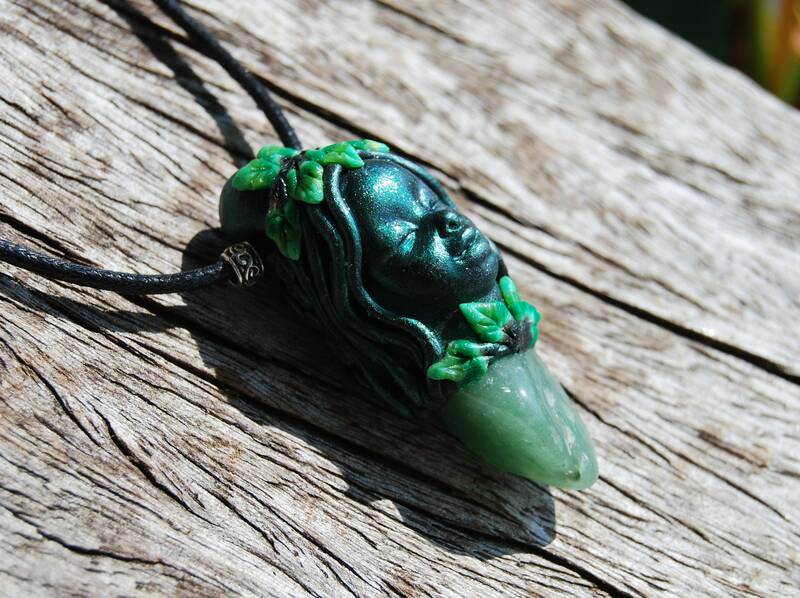 Aventurine is most commonly green, though it also forms in blue, red to reddish-brown, dusty purple, orange or peach, yellow, and silver gray. It is mostly translucent and often banded, but an overabundance of an included mineral may render it opaque. 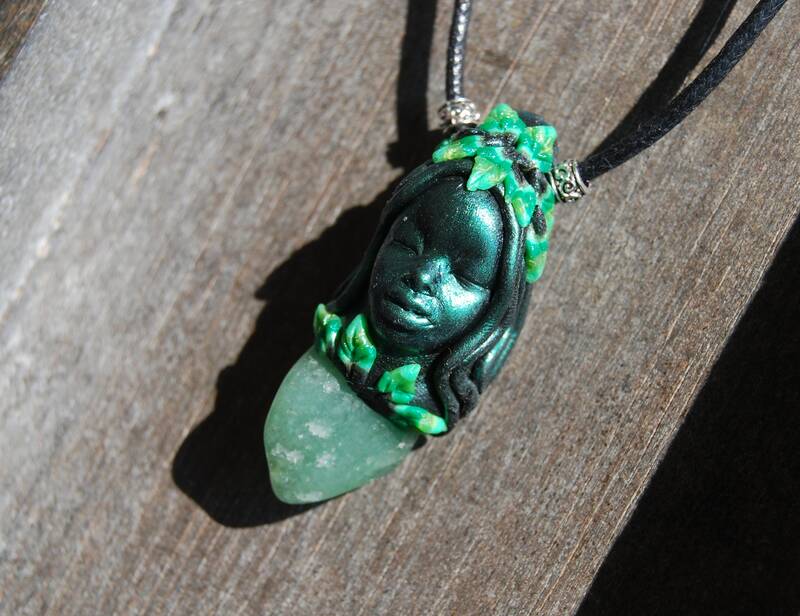 The color of Green Aventurine comes from Fuchsite particles within the Quartz, while shades of red, brown and orange are attributed to Hematite or Goethite inclusions. Peach and yellow Aventurine include Pyrite with their Mica crystals, Blue Aventurine contains inclusions of Dumortierite, while the purple variety is colored by Lepidolite. 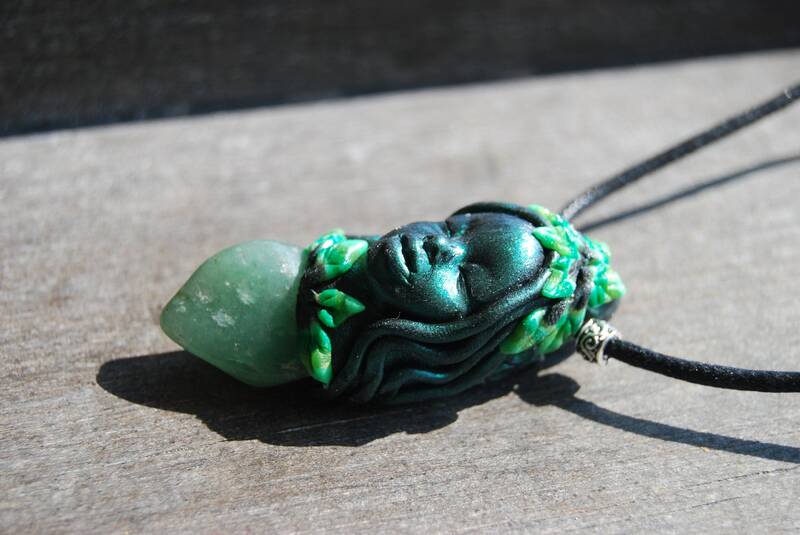 Aventurine carries a strong connection to Earth and the devic kingdom, providing a better understanding and appreciation of nature and its soothing vibrations upon the mind and body. 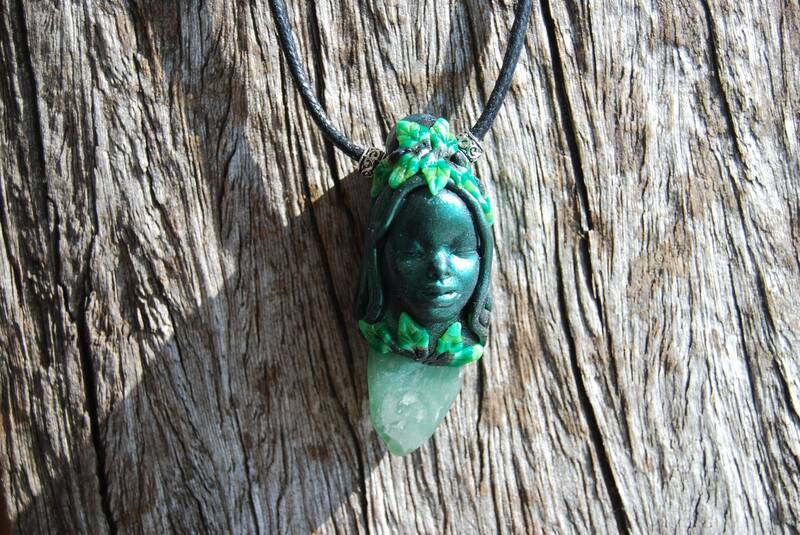 Aventurine is said to benefit one in all areas of creativity, and imagination, as well as intellect and mental clarity. Lore says that it enhances prosperity and brings career success. It is also said to bring luck, especially in games of chance and it is said to bring frienship to one's life. It is a gentle stone energetically that gives a sense of calm and balance and enhances happiness. It also helps one to see alternatives and potentials in all situations, giving a positive outlook, courage and inner strength. 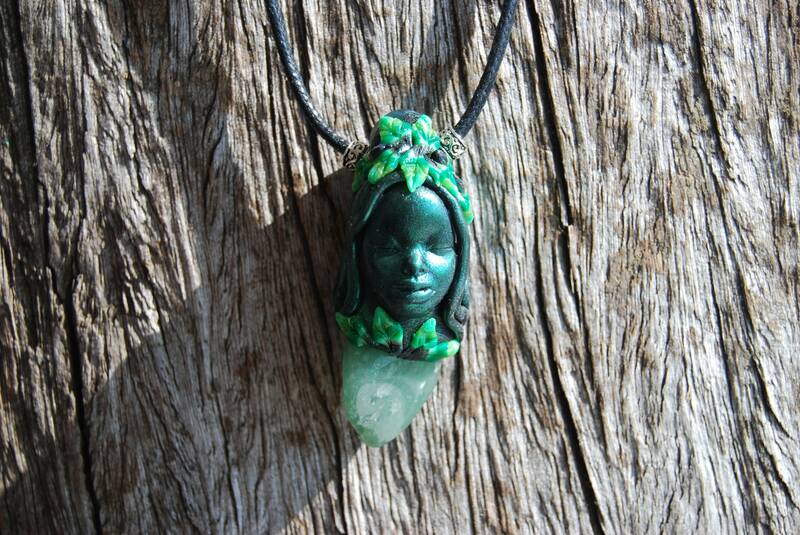 Aventurine is associated with the heart chakra. 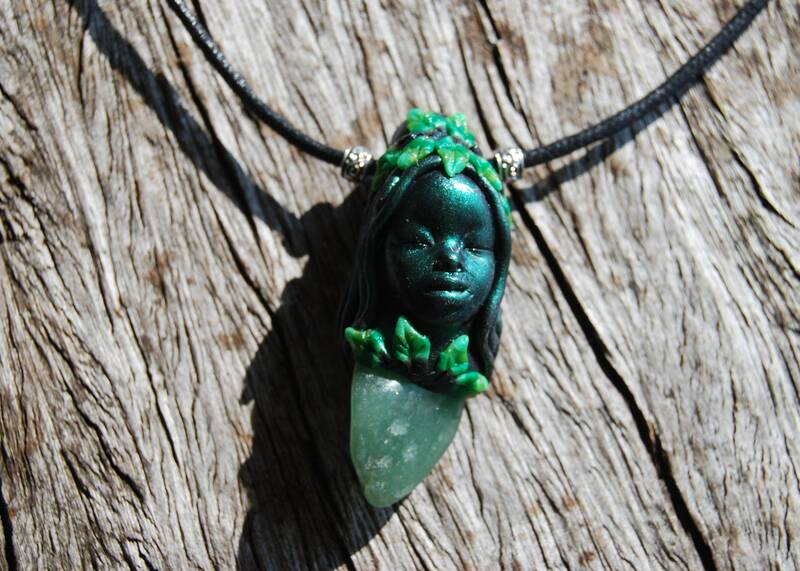 Green Aventurine is a comforter and heart healer, used to clear and activate the Heart Chakra for general well-being and emotional calm. It is also a powerful protector of the Heart Chakra, providing a shield to block entry from those who would “tap-in” and use the energy of another. This pendant is cleansed after I made it. In the process of making it, I think and connect with the gemstone(s) and its properties and how it will effect the wearer. I believe that the intentions that I use when I am creating a piece is important. All my jewelry is made with joy and intentions of love and compassion. Made with a combination of epoxy clay and polymer clay which makes it very strong and durable. It is better to take it off while showering or swimming though to extend the lifetime of the colors. A few raindrop is no problem. It comes on a adjustable strong cotton cord so you can make it longer or shorter, just the way you want it to hang. Measures 2.24 inches / 5.7 cm from top to bottom. Will be shipped in a giftbox with Trackingnr.